Fishing carp spring feeder can be very different result, because for this heat-loving fish need a certain water temperature. In the spring, not every body of water has time to warm up. Often the water in ponds and lakes in the bottom layer is almost the same as in winter — 3-4 degrees Celsius. And it can adversely affect the intensity of biting. But in some waters carp is better suited to the context of the cold water and begins to take in April with the advent of sustainable heat and Sunny days. Even at a water temperature of 8-9 degrees the carp are still inactive. Therefore, when you make a bait mixture has its own characteristics, where the summer fragrant supplements can be useless, while success can bring you made to bait the active elements. The fish will attract pop-UPS and moving to the bottom of the particle mixture. In particular successfully used bait for catching roach, has an active lifting of the particles which float and sink to the bottom. Suspender particles are kept suspended in the water column and move under the influence of small currents. All this attracts the fish. A good effect can be additive Halibut Super Crash with a fishy odor. 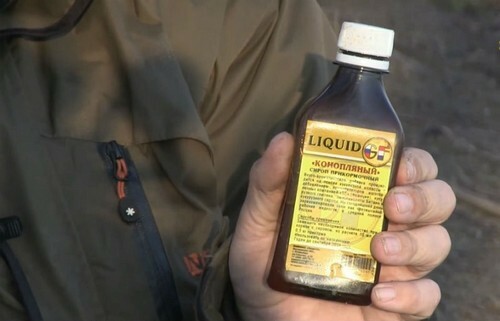 As a flavoring for carp fishing is often very productive bait used hemp syrup. The bait should be mixed thoroughly and filtered to obtain an even fractional composition. For mixing you can use a household drill with a nozzle for manual frothing or mixer. Water is added to the bait mixture in several stages, as when one-time addition of large amounts of liquid bait will not have time to absorb. The bait needs to be some small part of the bait or the nozzle that is used at this fishing. 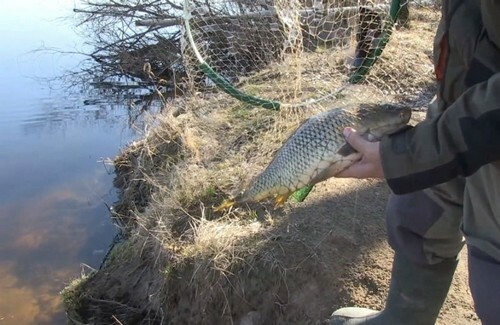 Fishing for carp in the spring on the feeder typically in shallow areas of reservoirs, where the early spring sun warmed the muddy or sandy spits and holds the big fish. Here the water warms up the fastest. And bask here come all the inhabitants of the pond or lake, from small to large… a lot depth in such places can be not more than half. But the best for the spring fishing will be the depth of about a meter or slightly more. In areas deeper than 1.5–2 meters can not wait not a single bite all day. Since such fishing often occurs in coastal areas of the reservoir, it does not require a very powerful and long feeder rod. It is enough if it will be with a length of 3-3,6 meters. Not for very far casts, which are produced in the coastal area, you can use monofilament fishing line. As it has a sufficient elongation, the rubber shock absorber in a snap there is no need. 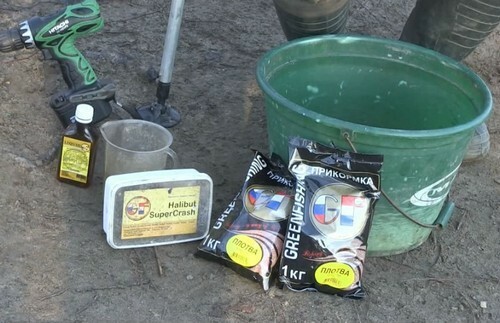 When playing a carp it is advisable to use the clutch, configure it for catching big fish. As the spring bait best suited manure worms with maggot known as the “sandwich.” The fit and bloodworms, but this is too small a bait for carp thick-lipped. You can also use maggots without the addition of the worm. The performance gives and introduction to the white dyed red maggot larvae. Just in case you need to always have in stock canned corn. It’s not quite spring nozzle, but it all depends on the pond and fishing circumstances. It may happen that for corn and will bite. This change in diet thermophilic carp often occurs with the arrival of warm, sometimes hot day when the bites on worm and maggots getting smaller. Often anglers fishing just finishing up and going home, then it should just change the nozzle. The trough standing waters are used easy open, no more than 40 grams of weight. 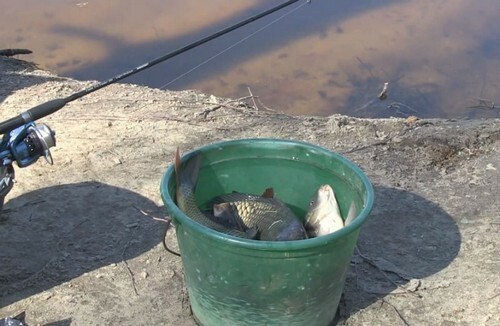 On the silt bottom, you can use feeders, flat (Flat Method), which is stable and not falling, lie on the muddy pillow. Fishing for carp in the spring on the feeder is not always successful due to weather features and a weak warm water, but it is the prospect of a subsequent fishing. Each time and each trip to the pond fishing will be more successful and profitable, as fish activity increases with water temperature.